A dank pool known as King John's Hole is said to exist somewhere on the southern side of the King's Lynn to Long Sutton Road. This is alleged to be the hiding place of King John's treasure, lost somewhere between Walpole St. Andrew and Long Sutton in Cambridgeshire, when the king, his army and his baggage train were surprised by the tide as he set out across the Wash in 1216, heading for Newark in Nottinghamshire. Source: W. A. Dutt: 'The Norfolk & Suffolk Coast' (T. Fisher Unwin, 1909), p.400. On an outside wall of the church (TF502168), in a corner between the north aisle and the chancel, is a stone figure about 20 inches high, very weathered. The architectural historian Pevsner says that it’s a 'caryatid', a female supporting figure, but local tradition says rather that it's an effigy of Tom Hickathrift, the famous Norfolk giant. Tom is said to have thrown a stone from the Marshland Smeeth through the church wall here, and a small hole used to be shown as proof. Meanwhile, in the churchyard Tom is believed to have defeated the Devil in either a wrestling match or a game of football, and some say the hole in the wall was caused by the Devil lobbing a ball at Tom. In more recent times, another tale seems to have arisen that a small hollow in the churchyard is the result of Hickathrift hurling a cannonball at the Devil, to frighten him away. At least, that is what the rector told the Fenland Family History Society in July 2006, when he gave them a guided tour of the church. The well-preserved Warham Camp hillfort (TF944409 area) was made in the Iron Age by the Iceni, but tradition says that it was actually built by the Danes, as a nearby field is called Sweyne's Meadow after an alleged Scandinavian chieftain. According to legend, the Saxons from Crabb's Castle (TF909395 area, a former earthwork at nearby Wighton) once drove the Danes out of Warham Camp by poisoning the river that follows past the ramparts. Source: R. H. Mottram: 'East Anglia' (Chapman & Hall, 1933), p.58. Right on the Watlington/Tottenhill parish boundary, on Watlington Road at TF636103, is a barely-noticeable bridge over a small stream. Tales tell that once, long ago, men stole the bells from Tottenhill church just over a mile away. As they were too heavy to carry away in one go, the robbers hid the bells under this bridge for safe-keeping - but, they were of course found, and the thieves later apprehended and hanged. After this event, the name of Thieves' Bridge stuck, and indeed a road, a wood and a nearby farm are now so named after the bridge. As it happens, one of the bells of St. Botolph's was indeed stolen in 1642, and it only has one now, so it seems the legend may have a kernel of truth. Source: Arthur Randell (ed. Enid Porter): ‘Sixty Years a Fenman’ (R & K P, 1966). P.78. An old oak in Wayland Wood, a little to the south-east of the town of Watton, was demolished by lightning in August 1879, with only the stump remaining. This is supposed to have been the very tree under which the bodies of the 'Babes' of the Babes in the Woods tale were found. The ballad was first published in Norwich in 1595, and it seems to have been very soon afterwards that this location was first identified with the events of the tale. The stump of the blasted oak was chained off, and the exact location apparently forgotten since the early 20th century. Charles Kent: 'The Land of the Babes in the Wood' (Jarrold & Sons, 1910), p.11 (includes picture of the alleged tree stump). George Jessop: 'Watton Through the Ages' (1985). ‘Norfolk Fair’ Vol.2, No.9, p.20. The miles-long Fossditch or Fendyke (TL771953 area) is said to have been created by the Devil dragging his foot along the ground, and later, in scraping off his boot, the clod of soil fell to form Thetford Castle earthworks. Source: Mark Knights: 'Peeps at the Past' (Jarrold & Sons, 1892), p.42. Near the church are the moated remains of the castle built in 1180 by Ralph de Plais. About a mile away, close to the road, is a round barrow known as Pepper Hill, or Pepper High Hill, (TL787882), from the tradition that here Cromwell stood his cannon to 'pepper' the castle. Source: W. G. Clarke: 'In Breckland Wilds' (Robert Scott, 1925), p.128. 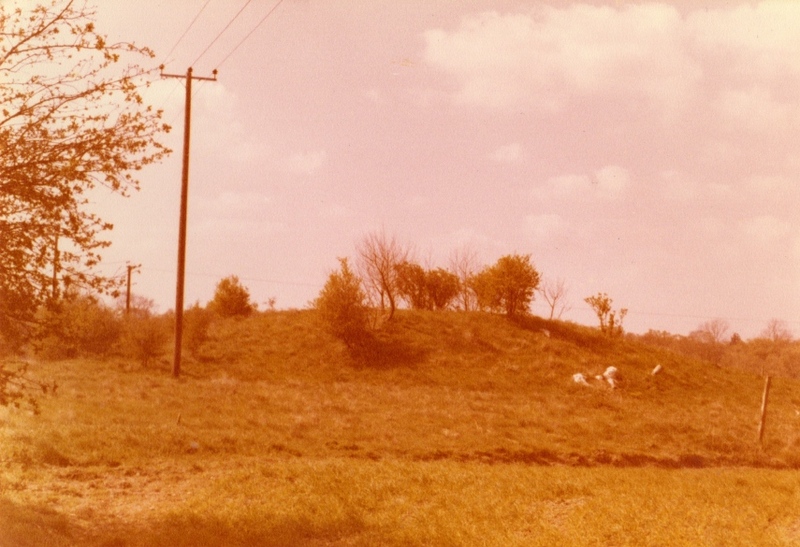 In one of several ancient burial mounds in Weeting parish, an unnamed man is said to have been buried standing upright. Blenheim House dates from 1740 and is said to have been used by smugglers, who had access to the quay via a secret tunnel. The tiny hamlet of Gold Hill (TL533923) sits beside the B1411 just inside Welney parish, next to the Hundred Foot Washes in the middle of Fenland, with the border between Norfolk and Cambridgeshire bisecting it. Once it was no more than a mound, only slightly raised above the marshland, where the old Fenmen lived a meagre existence in their rough huts. Here some of King John's treasure was said to have been hidden, stolen from him at Wisbech Castle long before the rest was washed away near Walpole St. Andrew. Source: W. H. Barrett: ‘Tales from the Fens’ (Routledge & Kegan Paul, 1963), p.133-5. Only the shell of the medieval St. Edmund's church (TG508117) now remains, but until its removal in 1896, there used to be on top of the tower a peculiar pyramid-like structure known as The Tomb, or the Maiden's Tomb, which would once have been visible from the sea. It was actually no more than the apex of the tiled roof projecting above the top of the tower, but the locals invented a tale for it. A young girl of Caister once had a bold sailor lover, who was shipwrecked and drowned just within sight of shore. The girl died of a broken heart, but first left orders that she was to be laid to rest on top of the tower and a pyramid built over her, to act as a warning to other ships. Source: W. A. Dutt: 'The Norfolk Broads' (Methuen, 1903), p.334. The Blood Hills here (TG473185 area, now covered with wind turbines) are traditionally named from a legend that on these slopes was fought a battle between Saxons and Vikings, a conflict so terrible that the hillsides ran red with blood. The name Gibbet Hill nearby also suggests other possibilities. Source: James Wentworth Day: 'Marshland Adventure' (Harrap & Co, 1950), p.33. Walton has a 13th century church of St. Mary (TF471133), and the tower, about 60 or 70 feet from the nave, stands on open arches at the entrance to the churchyard. Tradition says that the Devil tried to steal the entire tower, then attached to the church, but found it too heavy and dropped it where it stands. A slightly different version is given in 'Antiquities & Curiosities of the Church', published in 1896. The Devil was fond of using his demons, but this time, "instead of employing his own imps, he engaged 'a number of people' of the human race to carry (the tower) off. They were strong, for they got the tower on their shoulders, but they were not intelligent, as they could not get it through the gate, which was too narrow, nor over the churchyard wall, which was too high; and, after marching all round in search of an outlet, they dropped it where it stands." Others have said that the giant Tom Hickathrift picked it up for a bet, but dropped it because it was too heavy for him. Source: William Andrews (ed. ): 'Antiquities & Curiosities of the Church' (Hull Press, 1896), p.17. To the north of the village, Priory Farm (TF483137) is largely Victorian in structure. Although it may be on the site of an older building, there was never a monastic building here, the name being due to its former ownership by the Priory of Lewes. Nevertheless, there is a suggestion of monkish activity, evidenced by a floor slab in the kitchen with a ring in it, said to be the entrance to a tunnel with an unstated destination. According to a ploughman, there were 'hollow hills' in a field just north-east of St. Mary's church. This field (TF63301594) was called Church Close on the 1841 tithe map. Although "possible underground structure" is the suggestion by historians (who apparently haven't investigated) - but the phrase 'hollow hills' is well-known in folklore as having been applied to both ancient burial mounds, and the dwelling places of fairy folk. Sometimes they were one and the same. Neither can be seen here today. In the chancel of St. Andrew's church (TG027454) is a medieval altar-tomb, upon which are the full-size effigies of Sir William Gerbrygge and his wife, who are said to have founded the church in 1272. Until badly defaced, each held in their hands a small stone heart. Sir William actually still does, but that's the result of a partial restoration in the 1830's. 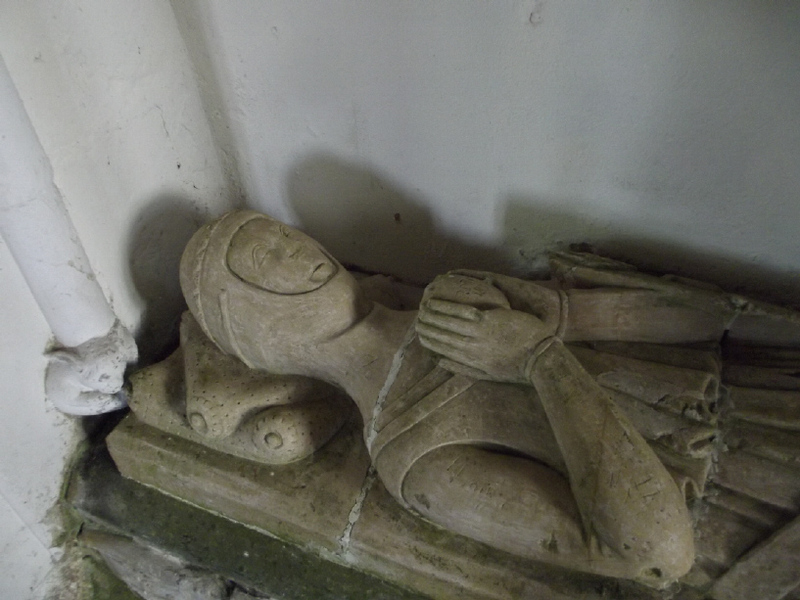 Despite the fact that one is obviously a woman, tales tell that these are the effigies of two brothers named Hampton, who quarreled over the boundaries of the parishes Wickhampton and Halvergate that each owned. 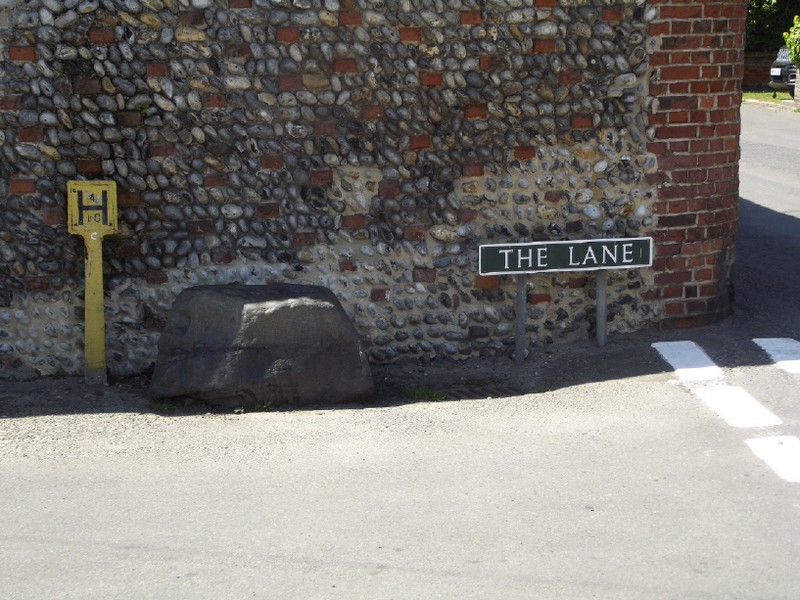 The quarrel became a battle, the site of which is said to be marked by a piece of flint masonry set into the side of a ditch somewhere along the boundary. For hours they fought with fist and sword until finally they tore out each other's heart. God in his fury turned them to stone and put their bodies in the church with their hearts in their hands as a dire warning to others. From that day the two parishes became known as Wicked Hampton and Hell Fire Gate. 'Choice Notes from Notes & Queries: Folk-Lore' (Bell & Daldy, 1859), p.165. John Glyde: 'The Norfolk Garland' (Jarrold & Sons, 1872), p.68. Every night, so it used to be said, a phantom coach emerges from a pit somewhere in this parish, and returns there after a quick ride round the area. Source: 'Eastern Counties Magazine, or Suffolk Note-Book', Vol.1, , No.2 (Nov. 1900), p.119. About two miles south of the 15th century church of St. Mary Magdalen is a farmhouse called Crabb's Abbey (TF601078). The name is all that's left of a 12th century convent for Augustinian nuns, Crabhouse Abbey. Old folk in the village say they can remember a tunnel once connecting the two. But if it went in a straight line, it must have passed beneath the Great Ouse river at least twice. Source: 'The East Anglian Magazine' (July 1975), p.430. Just north of the village, at TF936405, is the Old Vicarage. When the foundations were being dug in 1836, "a large quantity of human bones and ancient pikes" were uncovered, which local tales said were the remains of a battle between Saxons and Danes once fought here. Source: William White's History, Gazetteer, and Directory of Norfolk 1845. "A decayed veteran held together by iron bands, with its enormous arms propped up" is how the famed Winfarthing Oak (TM106871 area) was described in the early 20th century. Its remains can be found near Lodge Farm on the Earl of Albemarle's estate in Winfarthing, north of Diss. At the time of the Norman Conquest, it's said that this "magnificent tree which in 1744 measured 68 feet in circumference at the extremity of its roots" was reputed to have been called the Old Oak. In later times it was renamed the Bible Oak, from the fact that a box had been fitted to the tree to perform as a money collector for the British and Foreign Bible Society. This hollow shell, which finally crumbled in 1953, was so massive within that it could easily hold thirty men at one time, and indeed there could once be seen inside it a number of tables and chairs used to convene the Winfarthing parish meetings. W. A. Dutt: 'Norfolk' (Methuen, 1902), p.236. Lily Palmer, in the 'East Anglian Magazine' (Oct. 1960), p.712. In a road called The Lane, near its junction with Black Street, is a black granite boulder known to the natives simply as 'The Stone' (TG494195). This is roughly 1m x 60cm x 60cm high, and is obviously not in its original position, as it sits on top of the pavement. Only a few yards away, four roads meet to form the marketplace, and the stone used to be a favourite spot for the old fishermen to sit and tell yarns. "Were I was a Keeper we had a verry large Warren beside the road running from Wormagay. One day the warriners were digging at the bottom of a large hill were Oliver Cromwell was supposed to have planted his guns wen he destroyed Pentney Abby..."
2. Worstead Heritage Trails (Worstead Parish Council, July 2012), p.18. St. Mary's church features in another old legend, that of the phantom White Lady who only appeared there when the clock struck midnight on Christmas Eve. Ernest Suffling recorded that, in 1830, a drunken man swore that he would go there and ring the church bell at twelve, so that he could meet the Lady and give her a kiss. When no bell sounded, his fellow drinkers from the nearby King's Arms inn went in search of him, only to find him a gibbering mess in the bell chamber. Back at the inn, he revived a little, only to start crying wildly "I've seen her! There! There!" Then he collapsed again, and died the same day. Source: Ernest R. Suffling: 'History & Legends of the Broad District' (Jarrolds, 1891), p.127. Wymondham Abbey (TG106015), originally founded as a priory in 1107, is said to have a secret subterranean passage running from it to the nearby Green Dragon Inn, used once upon a time by 'misbehaving monks'. Barbara Vesey: 'The Hidden Places of East Anglia' (Travel Publishing Ltd, 7th edition, 2003), p.200.